Guide the Princess on her mission through the land of Albia and her meetings with its creatures… ——————————————————————————————————- ——————————————————————————————————- Guide the Princess on her mission through the land of Albia. She must defeat the Fire Wizard and reverse his spell to awaken Fire Mountain. 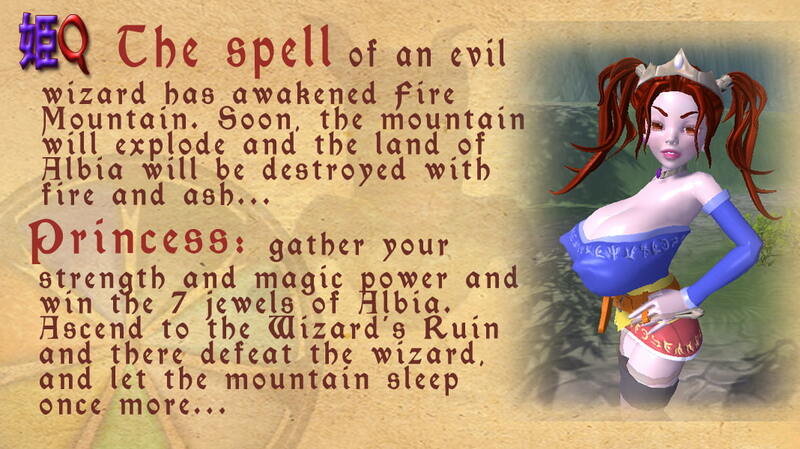 She must win the 7 jewels of Albia, which will give her the power of the Dragon Spell – the only way to defeat the wizard. On the way she will meet with trolls, orcs, dwarves, and other creatures of Albia… Explore the regions of Albia: village, forest, desert, river, jungle… Pick up food, magic potions, keys, gold and jewels. Climb the watch tower and look out over the country – then fly safely to the ground. If the creatures you meet on your way are hostile, you may cast spells at them: but often, to win the jewels of Albia, it is better to submit to the creatures’ desires… Princess’s Mission Report: exciting video scenes! Full video control. Widescreen, full 3D, RPG. Windows 7+ (64-bit) Display 1068×600 or greater (16:9) Please play the trial version to confirm compatibility before purchase.